A small uproar happened yesterday, October 20th, as President Trump announced that he intended to withdraw the United States from the Intermediate Range Nuclear Forces (INF) treaty signed by Reagan and Gorbachev in 1987 as the cold war wound down with a whimper. The treaty was designed to check escalating deployment of theater level nuclear weapons by both countries in Europe. 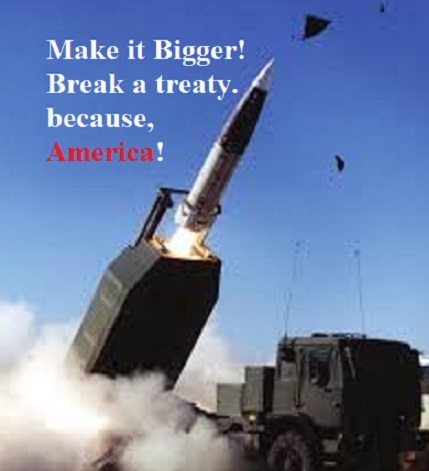 The American weapons that had been deployed, the Pershing II ballistic missile and the Gryphon GLCM (ground launch cruise missile), caused protests all over Europe as civilians in NATO countries did not enjoy the idea of being first strike nuclear targets. All of those missiles, along with their launcher vehicles and associated mobile systems were verified as destroyed by both countries. The United States has no short, medium or intermediate range ground launched missiles that can carry nuclear or large conventional warheads. The United States has no need for such weapons as the only viable targets that can be reached from US soil are Canada, Mexico and the Caribbean. Cuba can be targeted by US Army MLRS self propelled rocket artillery systems launching the MGM-140 Army Tactical Missile System (AtacMS) which falls just under the provisions of the INF and other treaties. The INF only covers missiles launched from stationary land platforms, trains, and trucks. The major American system that was eliminated, the Gryphon GLCM, as nearly identical to it's more well known and often used sibling the Tomahawk, which can be fired from aircraft, ships and submarines. The INF treaty is bilateral and does not restrict the development and deployment of missiles with a range of 340 to 3000 miles by other countries, notably in this case France and China and the UK. France decided in the 1990s that the Republic had no need of land based missiles, following the example of the UK. 95% of China's land based nuclear arsenal can target India or Russia but not the United States. Russia has been reviving it's theater level nuclear missile systems in semi-secret while the United States has been planning to go back to the drawing board since 2015. Russia deployed cruise missiles with conventional warheads from small ships in the Caspian Sea against ISIS targets in Syria that are nearly identical to ground based cold war systems in a loophole treaty work around that seemed to be mostly a warning to China and Turkey. The United States began the process of developing a new missile system for which there is little strategic need. Truck based American AtacMS systems deployed to NATO member countries Latvia and Estonia can reach Moscow. The same system in Turkey can hit most of European Russia and nearly all of the Russia's oil resources. Tomahawk missiles from American or British warships or submarines in the Baltic or Black Seas can do the same. Although the defense industry would love to build a new system for profit, such a system does nothing that can not be done already. Russia's rationale for the continued development of intermediate range ballistic and cruise missiles centers around China and India not Europe. The rocket on a truck concept makes strategic sense in Siberia. Based in Siberia and dispersed over a vast area, the range of the weapons negates much of the strategic depth of those two nuclear powers. Russia has shorter range missiles whose capabilities could be extended, which are cited by Washington insiders as the threat to be countered. These mirror a very similar Ukrainian system called the GROM-2. Both are similar in range to the AtcMS. The original mission concept of all of the weapons in this category made by all nations is a first strike against the nuclear arsenals rather than civilian populations of the target. Disruption of concentrated conventional forces to prevent a break through has always been a secondary consideration, with the exception of France. France intended to nuke Soviet forces in Germany during the cold war if they could not be contained. Trump's initiative to withdraw from the INF has been in motion for three years. Senators Warren (R-MA) and Mike Lee (R-Utah) sought to derail this with an amendment to the National Defense Authorization Act (NDAA) of 2017 requiring a study before funding development. $65 million was for development was authorized for this year and thus the treaty would have become broken the instant the first check was cut. The doomsday hints and other typical threats from Russian diplomats were likely per-recorded over a year ago. Despite the fact that a more advanced version of the basic GLCM system could be built quickly, something new will be invented after semi-competitive bids over the next two years and developed over two or three more. Whatever the result is it will be a tactical solution to a non-existent strategic problem in a war that will never be fought.